Do you need a little help preparing for the 2016 Highmark QUAD Run?! Join us on August 22 and 29 and get a jump start on the competition by running the course. 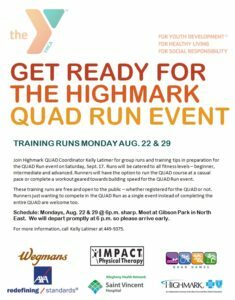 Join Highmark QUAD Coordinator Kelly Latimer for group runs and training tips in preparation for the QUAD Run event on Saturday, Sept. 17. Runs will be catered to all fitness levels – beginner, intermediate and advanced. Runners will have the option to run the QUAD course at a casual pace or complete a workout geared towards building speed for the QUAD Run event. These training runs are free and open to the public – whether registered for the QUAD or not. Runners just wanting to compete in the QUAD Run as a single event instead of completing the entire QUAD are welcome too. Schedule: Mondays, Aug. 22 & 29 @ 6p.m. sharp. Meet at Gibson Park in North East. We will depart promptly at 6 p.m. so please arrive early. A big thank you to our run sponsors: Highmark, AXA Advisors, Wegmans, Impact Phyiscal Therapy, Achilles Running Shop and St. Vincent!